Five years ago, I sat in a small conference room with a local real estate entrepreneur discussing his new organization with the unlikely mission to “Change Maryland” from its tax-and-spend ways. 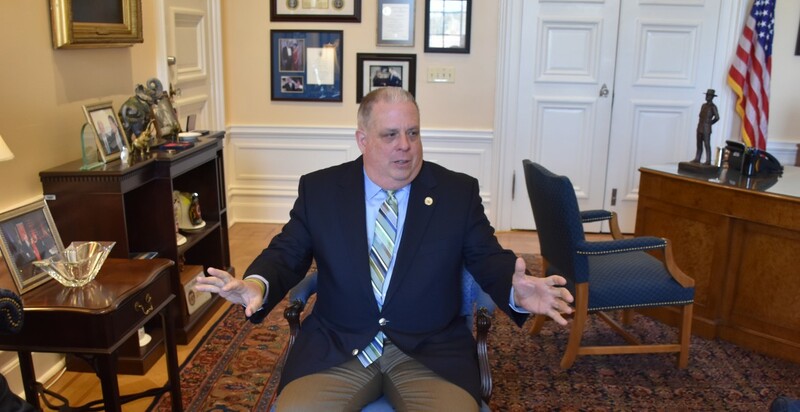 Late Friday afternoon, I sat down with Larry Hogan again, this time in his more spacious digs in the 240-year-old State House discussing how far Maryland has come in that time. “I’m very pleased with where we are at this point,” Gov. Hogan told me, summing his view of the legislative session. No longer a novice elected official, he is as blunt and self-assured as ever, packing a wealth of experience into 14-months in office. An oddity as the Republican governor of a blue state and its hyper-Democratic legislature, he has battled formidable challenges. Not just the expected test of dealing with the Mikes — Senate President Miller and House Speaker Busch — who have together 72 more years experience in State House governance than he has. But a six-month long battle with lymphoma that could have killed him, the state’s major city in flames after a day of riots last year, and a governor’s more commonplace crises of a blizzard and other emergencies. Of course, we talked about taxes and spending: The least contentious and swiftest passage of a budget in a decade, with huge reserves of extra cash and no tax hikes; the prospect of actual tax cuts, about which Hogan is more hopeful than optimistic; the legislature’s override of a veto on transportation scoring, a bill he blames on Montgomery County developers. And there were a couple of small surprises, like his talk with Virginia’s Democratic governor about trading legislatures, and the guitar hanging on the wall signed by one of his favorite country music stars that is a reminder of his biggest challenge and personal success. The most important thing is that Larry Hogan is still alive. He will turn 60 next month, which was no certainty last June after he found a lump in his throat on a trade mission to Asia. His hair, once a heavy shock of white-grey which he had for 20 years, is coming back. “Now it’s about half and half,” dark and white. “It’s sort of not coming in evenly.” He gets it trimmed so it all stays about the same length. Spending and tax cuts are always top of mind with Hogan. His campaign mantra and governing principle is to roll back as many of the tax hikes of former Gov. Martin O’Malley as he can. Controlling spending is the easier task with perhaps the strongest “executive budget” of any governor in the country, allowing the legislature only to cut his spending plan. The persistent structural deficits have been cured for at least several years. Cutting taxes has been far less successful, but he succeeded in at least changing the dialogue from tax hikes to cuts. “I’m hopeful that we’re going to get something done. But the fact that we’re actually talking about tax cuts — that wouldn’t have happened two years ago. Friday’s interview took place hours after the Senate overrode his veto of the new transportation scoring bill, one of only two bills he chose to fight. It would have required him to rate transportation projects before deciding which ones to fund. Why did he choose to fight this so strenuously? “I fight on the things that are really important even if we’re not going to win because it’s worth fighting for,” said the governor. “I think it was really bad bill in the first place,” though he admits it got better as provisions were stripped. “I think it was a terrible mistake for them to override that veto. And I think most people in Maryland are going to agree with that. And I think they are going to find that people are going to be very upset that they are trying to mess with their local roads. Wait a minute. Don’t you have all that money to spend on roads because the legislature passed a gas tax hike in 2013 that you tried to roll back last year? “Everyone is really happy about that. Every local government is thrilled,” the governor said. Are you going to invite them to the ribbon cutting for new road projects? Hogan had proposed a bill relieving governors from some mandates that control over 80% of the discretionary general fund budget. That legislation has gone nowhere. Yet, while he vetoed the transportation scoring which he concedes in its present form doesn’t actually force him to do anything, he allowed several bills with new mandates to become law without his signature. “We’re not thrilled with mandated spending, but in many cases we supported the program,” Hogan said. He found a five year mandate for spending to demolish boarded up homes in Baltimore both amusing and superfluous. “The blight stuff is my baby,” Hogan said. “I dreamt it up myself, personally. I got people working on it for a year. We went and announced it” in the fall with the mayor and other Democratic officials. 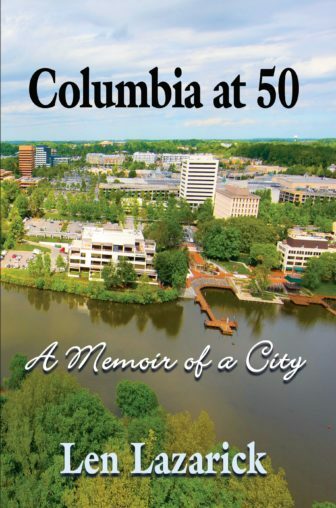 He worked out an memorandum of understanding with the city and put funding in a supplemental budget. The governor set up a commission to recommend changes for drawing new congressional and legislative lines. It recommended an independent, nonpartisan commission. Perfunctory hearings were held, but the bills have not even come up for committee votes. Democratic leaders refuse to act unless Republican-controlled states take similar actions to curb gerrymandering, drawing district lines for partisan gain. “But why can’t we be the first? Everybody makes an excuse about why we can’t do it. If we were to take action, it would be something the rest of the country could look to. The other states would say maybe we should do it too. Will Hogan bring the proposal back next year? Democratic supporters of change in gerrymandering have proposed Maryland enter in a compact with Virginia or Pennsylvania to sign a compact to make their redistricting nonpartisan too. Both states have Democratic governors and Republican controlled legislatures, which gerrymandered congressional districts in favor of the GOP; Maryland did the opposite. Asked about a potential deal, Hogan said he has discussed a different tradeoff with Virginia’s chief executive. Hogan was reminded that’s an issue where he actually proposed giving up his own power to redraw lines in favor of an independent nonpartisan commission. It might pass easily in the first year of the second term Hogan would like to win, since he would draw the lines in 2021. “I’m betting that in 2019, you’re going to pass this thing unanimously,” Hogan told Miller, laughing as he recounts the story. “I don’t think the people are going to be happy that they keep shooting down all the things that we’re proposing. It doesn’t hurt me, it hurts those people,” such as the retirees not getting an added personal exemption on their income taxes, or the small businesses who will still have to pay a $300 annual registration fee for the privilege of doing business in Maryland. “I’m very pleased with where we are at this point” in the General Assembly. Is redistricting reform necessary or possible?